Arglist had talked to the mirror as well. For someone so obsessive about her appearance, it had always puzzled Snow White that the other woman seemed so unsure of herself in private - always asking the mirror if she really was the most beautiful woman in the land, if she really was the most desirable. What was more, although Snow White had been little more than a child at the time and was now certain that it had merely been the fanciful imagining of childhood, she distinctly remembered the mirror talking back. Snow White still felt uneasy. She feared this magical device. Could she truly trust something that had been so dear to a woman who had damaged her so? "I cannot force you to do anything," the mirror pressed undeterred, "but I do know this: If you would have joy again, you must recall how you first found it and the answer lies within you. If you would have strength again you must likewise recall how you discovered it before. It lies beyond the pain. Have you not said yourself that you no longer remember how you might be happy again? Look deeply, see what you were, and you may! What you experience now are but shadows of things that have already been. There is nothing that can hurt you but you yourself." David takes a different route with this Snow White retelling. Snow White herself has aged and is currently wallowing in grief for her dead husband, King Charming. She has turned into herself and become weak and self pitying. I found it hard to connect with Snow White because she would comment, to herself and others, that she had been so dependent on Charming that without him she was nothing. Now, I have not lost a husband of thirty years so I'm in no position to say how I would or would not act, but I wanted to just snap her out of it. After having a meeting with Erfreut, the last living dwarf, about her daughter's upcoming wedding, Snow White goes up to the tower where her stepmother lived. It is there, in the dust covered room, that she stumbles upon the magic mirror. I appreciate the fact that David gave it personality and a purpose. The mirror constantly tells Snow White that it shows the truth, whether one wants to see it or not. I especially like when it told Snow White that it does "not offer advice. I simply show that which is right in front of me. You must decide how to act on what you see. You can run from it or you can embrace it." After bemoaning to the mirror about how she is lost without Charming and whatever is she going to do, the mirror begins to show her snippets of her past. We see moments with her father, the abuse by her stepmother, her meeting with Charming, and many other memories that shaped Snow White's character. I love this approach as it is as if the mirror is reminding Snow White of her strength and courage, without Charming. That despite what she thinks at this moment, she still has a life to live and a daughter who needs her. 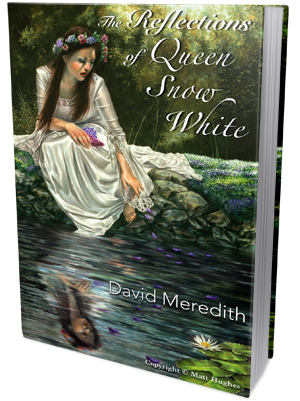 The Reflections of Queen Snow White is a quick read, but I thoroughly enjoyed the continuation of Snow White's story. It's a story of an old woman finding herself and remembering those lessons that she had long forgotten. That even after "happily ever after" appears to end, it's not over. One of my favorite lines occurs on the last page, though it is slightly spoilery: "But most importantly, she saw a princess of raven hair and skin of purest snow with lips like the red, red rose who had finally found her happily ever after."